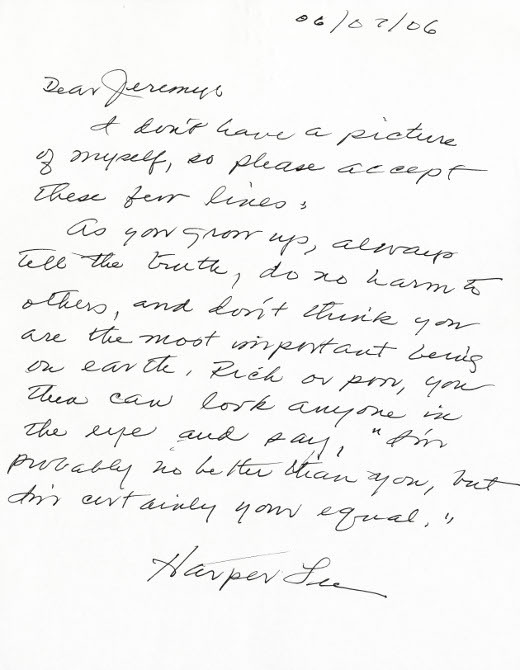 Harper Lee wrote To Kill a Mockingbird in 1960. More than a half decade later, the novel remains one of the most widely-read books in American classrooms. And students still write the 89-year-old author, requesting photographs and autographs. As you grow up, always tell the truth, do no harm to others, and don't think you are the most important being on earth. Rich or poor, you then can look anyone in the eye and say, "I'm probably no better than you, but I'm certainly your equal." Lee's second novel, Go Set a Watchman, was just released last week -- 55 years after her debut. You can read the first chapter (and also hear Reese Witherspoon read it aloud) here.